If you're among the many, many potential Nexus 7 users who think that 8GB (or even 16GB) is a little on the wimpy side for a modern tablet, you may have cause to celebrate soon enough. 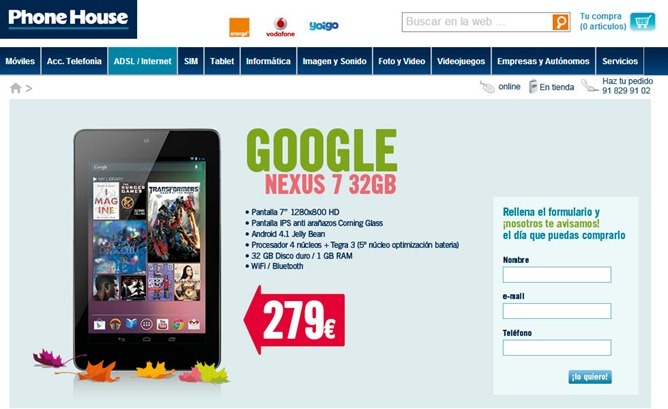 The Spanish storefront of Phone House (the international arm of UK-based Carphone Warehouse) has a promotional page up for the Google-branded tablet in a 32GB flavor, listing for 279€. My Spanish is a little rusty, but it looks like the typical "sign up for more information" pre-sale page. No date is mentioned. The price is thirty Euros higher than the 16GB model, which has been available in Spain since late August. This may put a dent in the rumor that the 32GB model would replace the 16GB model in price, at least in Europe - while we've seen plenty of evidence that various retailers are preparing to sell the beefed-up Nexus 7, the ones in the US have been in the $270 range. Then again, Google only sets the recommended price: retailers could be bumping up the 32GB model until they run out of stock for the 16GB version. There's still no confirmation or concrete release date for the 32GB Nexus 7. So sit tight, gamers and HD addicts.